With the assistance of our team of professionals, we are offering HSFG Washers to our esteemed clients. The offered washers are fabricated using the finest grade raw material and latest technology in compliance with the set industry standards. These products are also tested on various parameters to ensure flawlessness. 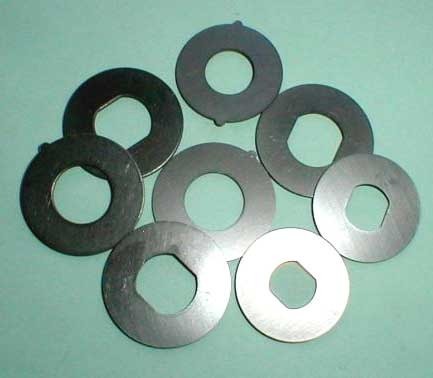 Our clients can avail the offered washers from us in various customized options at competitive prices. Confirming to Indian Standard (IS.) 6649 / ISO.7415 & DIN.6916. Material: High Tensile (H.T.) < Hardness HRC. 38 45. Sizes: From Dia. M 10 -Up To-M 30 Dia. (Only in Metric Series). Established in the year 1961, at Mumbai (Maharashtra, India), we “Mahavir Industries” have established ourselves as the flagship Manufacturer, exporter and Trader and Supplier of qualitative fasteners. from 1961 a long experience and knowledge in this domain, we have come with a large assortment of best-in-class products that includes Industrial Nuts, Industrial Bolts, Industrial Washers, Industrial Screws, Industrial Rivets, Industrial Stud, Clamp & Bracket etc. Today, we feel proud to announce that we are successfully meeting the demand of numerous constructions, automotive and mechanical industries. Our offered fasteners are precisely manufactured from high grade raw material and contemporary technology in compliance with international quality standards. Our offered fasteners are highly appreciated and acclaimed among the clients for some of the their unique attributes like flawless finish, high strength, robust construction, durability, light weight, sturdiness, corrosion resistance, accurate dimension etc. In addition to this, we offer our product range in various specifications as per the detailed given by the customers.